More than just recipes! The 8 broads are a really fun bunch of ladies with over 150 years of innkeeping experience between them. So, in addition to the recipes that we are posting .. at an admittedly slower rate during our busy summer months.. we are going to share a little more about ourselves, our kitchens and the amazing amount of fun we have doing what we do. Danielle (that’s her in the facebook profile pic this week hanging onto a Maryland Blue Crab, a specialty in her neck of the woods, the Chesapeake) innkeeper at The Brampton is not far from the water and there is boating, fishing and I am sure, crabbing galore. On a recent .. ok. so there was snow flying .. we gathered in her bright and cheery keeping room, laughed as we downed amazing biscotti and mountains of the best cookies ever. 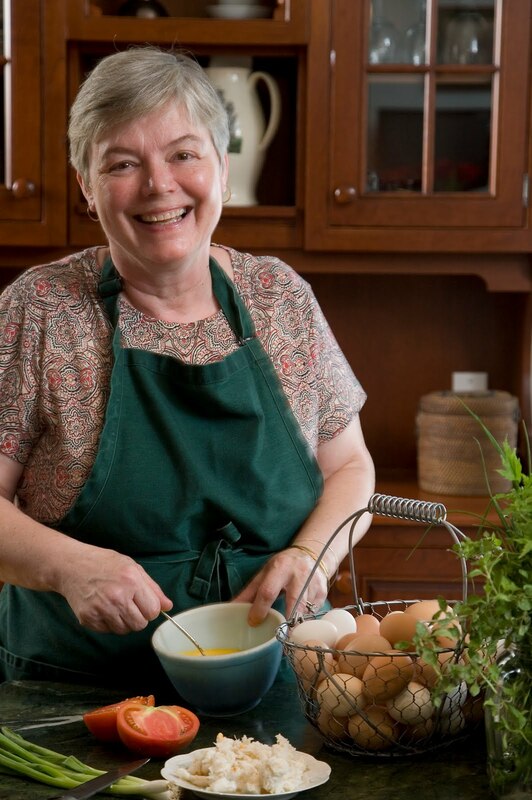 Her kitchen was abuzz with more cookies being made, shirred eggs ready for the oven and truly Swiss Birchermuesli. Had it been the right time of year breakfast on the most amazing front porch ever would have truly been in order. After cooking for 24 an a-la-carte breakfast in less than an hour this morning (it seemed that there was a conspiracy for everybody to sit down at once) I would say that my favorite appliance is my 6 burner, 24 inch griddle top, 2 oven Vulcan stove. It’s 19 years old beauty, (old enough to vote), but I couldn’t live without it. A voting Vulcan! Gotta love that. I bet that stove has stories to tell!